PONCRISP オリジナル商品 – Shibuya Rex Co.,L td. technique oftraditional puffed rice cakes. Americans are very health-conscious. A wide variety of health-intended food products are available at American supermarkets. One of the typical foods eaten at breakfast is puffed rice cake (known as Rice Cakes in America). The puffed rice cake or puffed cereal is a traditional snack that had been loved by Japanese people. It was our dream to make snacks that can be easily eaten by every person and would be accepted in America where many people are health-conscious by reworking Rice Cakes which have already been recognized by Americans. 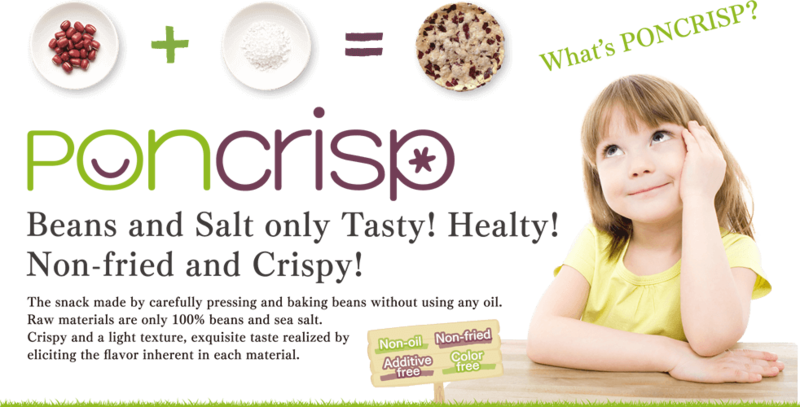 This ambition gave birth to a new type of product made from only beans and salt, having crisp and crunchy texture, non-fried and healthy snack; “PONCRISP”. The naming, logo and package design have been created through trial and error without compromise. Due to its difficulties in bulking and forming beans and property of being cracked easily, “PONCRISP” cannot be produced with a normal production technique. The maker’s confidence and pride are embedded in this product. The first “PON” implies a traditional Japanese technique to make puffed rice cake, and the second “PON” implies a pleasure to eat snacks. 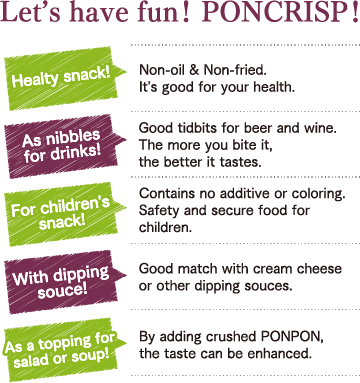 “PONCRISP” has been produced not only to support a healthy life but to make people happy.